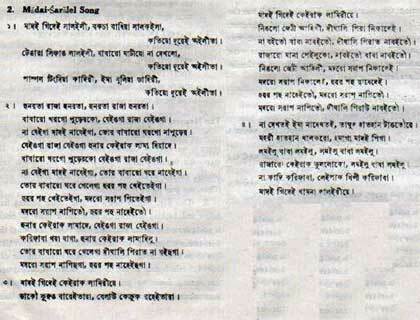 Madoi Soralelor Ela’s (Madoi Soralel Songs, মাদই সরাহালর এলা) are the ancient folk songs composed in Medieval Bishnupriya Manipuri Language, in between the period 1650 A.D. -1700 A.D. These are one of the most renowned ancient folk song in Bishnupriya Manipuri, which has been handed down through oral tradition. This song was composed during the last part of Chorai Rongba’s reign, i.e., during the first part of the eighteenth century, when the Vaishnavism of Sri Caitanya entered into the society, as a result of which a cultural conflict arose therein. This song has a clear reference to drinking and eating of meat – custom which goes back to a period anterior to the conversion of these people to the school of Lord Sri Chaitanya. This song, therefore, points to a period when Vaishnavism or Sri Chaitanya or any other sect of Vaishnavism had not struck its roots into the hearts of the people. (One day, Madai hears a loud noise coming from below and, looking downwards, finds that a mass of smoke is rising from her father’s house.) She tells the king that her father’s house is in flames and requests him to allow her to go to her father’s house. Saralel first tells her that her father’s house is not on fire. When Madai expresses her strong desire to go, he says that he, apprehends she may take meat and wine if she goes to her father’s house. Madai promises that she will not take meat and wine there. Then Saralel proposes that Madai should keep Kari Phaba, her son, with him and go to her father’s house alone. Madai accepts the proposal. Saralel warns her not to sit on long couches. He then stretches downwards a golden ladder. Madoi descends along the golden ladder. All look at her joyfully. When she comes, her father orders the family-members to offer a long couch to her. Midai declines to take her seat on the couch. Then, the father ,orders them to offer her drink and meat, of boar cooked. Madai declines to take wine and meat of boar. Then, the father proposes to offer her wine at a place ,covered by seven mosquito-nets, so that Saralel does not see her taking wine. (Madai accepts the proposal. When she is just going to take a sip of wine, Saralel spits from above, and the spit, passing through the seven mosquito-nets, falls upon the wine-pot. Madai understands the matter.) Looking behind, Madai finds that Saralel is lifting the golden ladder. She is greatly shocked, cries loudly, consoles Kari Phaba from below and passes over hills and dales. Bishnupriya Manipuris should write their own history ! Visit Bishnupriya Manipuri unicode websites in your Mobile!